Synopsis is the Collective 4tet's fourth release on Leo records. The first, The Ropedancer (LEO LAB CD021), was originally recorded for Swiss Radio DRS II in 1994. Impressed with his recording work for altoist Rob Brown, the 4tet's instigator and percussionist Heinz Geisser brought in sound engineer Jon Rosenberg to record Orca in 1996 (CD031). Live at Crescent (CD043) documented a gig in Belfast, Northern Ireland, in 1997, a burst of quadruple energy it was impossible to leave on the shelf. For this release, Geisser took the quartet back into a NYC studio with Rosenberg in November 2002. 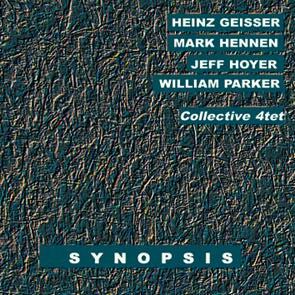 As the five-year gap and the title imply, Synopsis provides an overview of what the Collective 4tet can do. The 4tet have been applauded by the better jazz critics, with four stars from the Penguin Guide To Jazz for Orca, and high praise from Cadence, Jazziz, Swing Journal Tokyo, The Wire and Hi-Fi News. In penning their encomia, the writers all sound a bit stunned, as if it is slightly incredible that Free Jazz without genuflection to marketing tags - Neo-Classicism, Post-Rock, Minimalism, World Music, Ambient, Noise, Ecstatic, Nordic Cool, Berlin Reductionism, New London Silence etc etc - can still sound so vigorous and coherent, open and passionate, so "Now". The embrace of Free Jazz by a US post-rock scene craving the politics and aesthetics of the 60s has had the bizarre and distorting effect of all revivals. As with the Dixieland Revival or Oasis pastiching the Beatles, it's often hard to discern whether we're being sold an image or a reality. With the Collective 4tet, however, we hear Free Jazz that isn't expressionist bluster or ersatz Aylerism - facile images of 60s rebellion, the aural equivalent of a Che poster - but a splice of intuition and intellect that is poised and avid: truly collective. This music can be difficult to listen to, not because it's the sound of one man screeching in your face, but because it's replete with musical ideas, and each member of the quartet is discussing them at the same time. The net effect is sobering: the Collective 4tet may be where we actually are once all the hype and holler dies down. One standby of musicians faced with that promotional nuisance, an interviewer, is the wellworn gambit "let's get rid of labels and let the music speak for itself". Although this uses words to deny the value of words (all words are "labels" in a way), and is therefore what philosophers call an "otiose proposition", it's certainly true that marketing tags tell us very little about the internal dynamics of musical production: musicianly impatience with post-hoc definitions is understandable. However, the music of the Collective 4tet remains jazz because the players all have that robust, authoritative sense of playing self - "improvisor confidence" - characteristic of the form. But jazz is a method of musical production, not a formal limit. Heinz Geisser's drumming - usefully described by NYC critic Chris Kelsey as "omni-directional" - opens up the speculative space of post-Trane jazz and sets the agenda for the quartet. The piano has frequently been the transmission belt for symphonic ideas into the improvised idiom, because an orchestral score can most conveniently be realised by a solitary person on a piano (only the record or CD player provides any competition). At the start of "Convergence", Mark Hennen shows he is conversant with the Second Viennese School, that tinkling, astral, atonal revolution that shook - and finally demolished - the whole edifice of Western music. The atmosphere is reminiscent of Archie Shepp's piano notes at the start of "On This Night" where - contradicting every clich� about Black Nationalist Free Jazz being about saxophone bluster - he set up a sparse, charged, twinkling universe for Christine Spencer's bel canto soprano. The words she sang were about workers' revolution (a tribute to W. E. B. Dubois, the great American Marxist), yet Shepp invoked the free atonality of Schoenberg. Hennen's atonalism doesn't imitate Shepp, but it states with equal conviction that Free Jazz can use every sound, learn from every source. Jeff Hoyer's trombone has a special place in this music. Despite their name, the Collective 4tet do not completely abandon the instrumental hierarchy of jazz in the manner of those influenced by John Stevens' Spontaneous Music Ensemble (in the States, this select group includes Weather Report and John Zorn's Cobra). When Hoyer plays a note, he is immediately the vocalist, centre-stage and standing out front, he hasn't deconstructed his line into the multiple timbres and energies of a Rutherford or Mangelsdorff. Yet he is addressing the rest of the quartet equally, he isn't just worrying about the changes (watching Hennen) or duelling with the drummer (watching Geisser). The Collective 4tet think in "now" time, every instant is a climax, the golden moment, a pivot for multiple possibility. The music can skew off into something else in a micro-second. The wonder is that, given this refusal of given or predetermined structures, the music does not become unvariegated or monotonous (a problem which plagued Zorn's Parachute Years experiments). Hoyer's highly individualised phrasing sets a conversational tone which allows one to hear all the music as four-way discussion. The opening of the title track threatens to dissolve into a merely pretty evocation of Alice Coltrane's modal sublime, but Hoyer's trombone immediately reminds the quartet of its high-pressured analytical dialectic. The pleasure of jazz is the singular rhythmic Gestalt of a particular combination of musicians, which is why attempts to frame any one moment in its history as "classic" modelled on European classical music's embalming of past periods renders it impersonal and unattractive (another reason for musicians to distrust "labels"). Synopsis becomes more relaxed as it unfolds, but the aptly-named "Jig" has a dancing quality. William Parker's bassviolin, which throughout the set has provided the majestic, crystalline rhythmic matrix for the quartet's discussion, takes centre position, a master class in how sensitive and flexible and reflective a driving rhythm can be. Listen to Geisser's eloquent cymbal splashes: here a drummer becomes the vocalist. When the tune is over, don't be in a hurry to put on another CD. There is a brief return, a splash of iridescence, a compressed jewel, 56-second gift to the listener who's been affected enough by the music to sit a while in silence.